The blueprint for job search success! You picked up this book because you're caught in times of upheaval, crisis, and change; you need help navigating the treacherous new world of job search. 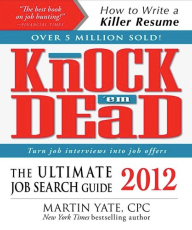 For more than twenty-five years, New York Times bestseller Martin Yate, CPC, has delivered for millions of first-time job seekers, executives, and career changers. Now you can turn to him for a proven method to put your job search and career back on track. This powerful 26th edition is packed with the latest online tools, tips, and tricks to land the job you want. "Required reading" says Library Journal.